All illness first begins in the mind as unloving ( egoisitic) thoughts and if it is not fixed; it will blow up into physical ailments! Now one has to take a conscious decision to Let Go of their thoughts and if you don’t decide memory I.e history will repeat itself! Nobody is responsible for your freedom but you! Develop your wisdom of Self Realization and exercise your will power and Let Go and Let Love flow into your life! Love is awareness! When your Mindful of your thoughts and feeling that is Love I.e letting go and letting love flow in your life! 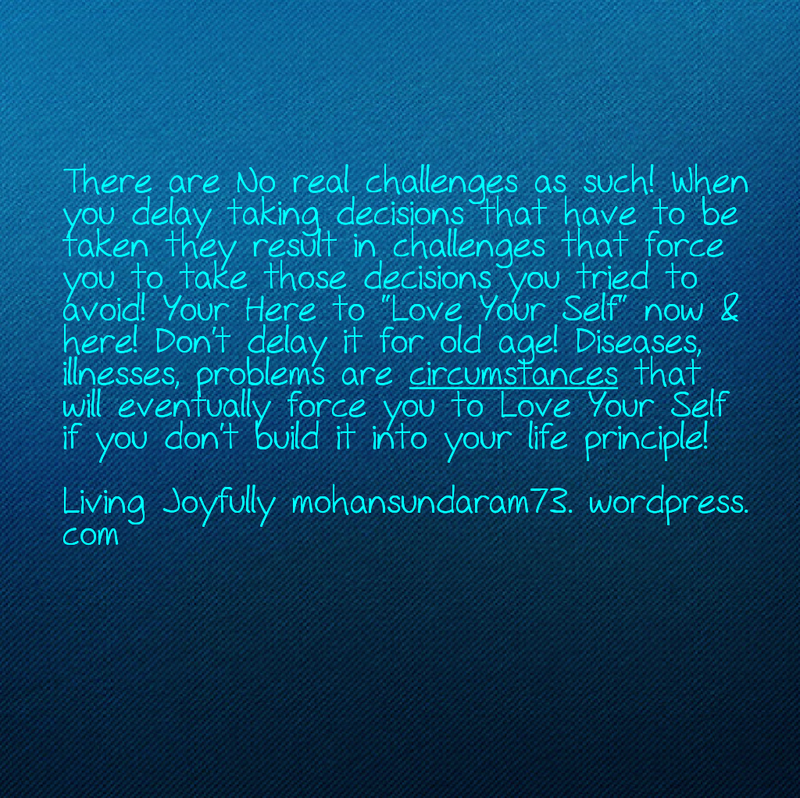 If you delay this decision you will be forced to take the decision to Let Go and Let Love in! The reason why people delay taking decisions is they have no clue on life purpose and who they are truly! When your uncertain the easiest thing is to defer decisions and let history repeat and blame fate, blame family, blame anything and anyone you can find! Those who truly want to progress and evolve in life must take 100% responsibility! There is no such thing as 99% responsibility! Being 100% responsible is about knowing your real self! When you take that as your task your being 100% responsible! When you know your real self there is no need TO LOVE anyone or anything for you become LOVE itself and love is the source of all life and powers of the cosmos! Love flows freely into your life if you let go of all your thoughts – good and bad! If you were a cup and filled with dirty water how can you get filled with clean water? First you have to get rid of your dirty water, clean up and then clean water can pour in! So too thoughts stop the flow of love ( cosmic energy) through your energy channels! The more egotistical the thoughts the impairment of flow of love is more and soon you fall I’ll!! Live Mindfully! Be aware of your thoughts! Your power is in your thoughts and your most powerful when you Let Go of All thoughts!